Harding University and the Harding Read program donated C.S. Lewis: The Space Trilogy books to the Southwest Middle School, Ahlf Junior High School, and Searcy High School libraries. On hand to present these donations were Harding University president, Dr. Bruce McClarty, and C.S. Lewis's stepson Douglas Gresham. Gresham will be speaking tonight at the Harding University's American Studies Institute event on the writings of his stepfather, C.S. Lewis. Searcy School District thanks Harding University for its continuous educational partnership and generosity, and we were happy to welcome Mr. Gresham today. 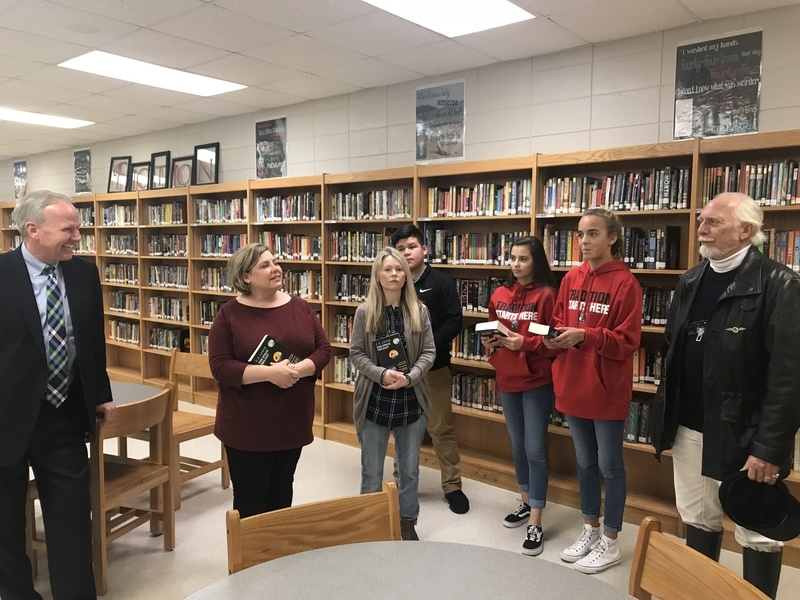 Pictured with Dr. Bruce McClarty and Douglas Gresham are Superintendent Diane Barrett, Searcy School District media specialists Brooke Higgs, Cristy Farley, and Mitzi Cannon, and students Anthony Gomez, Sara Daniel, and Irena Shala.